Last week Statistics NZ released their latest detailed population estimates for the country and they show that Auckland is continuing to grow at a rapid pace. Population increased by an estimated 44,400 people, an annual increase of 2.8% making it the fastest growing region in NZ and of course Auckland already started with the largest base. 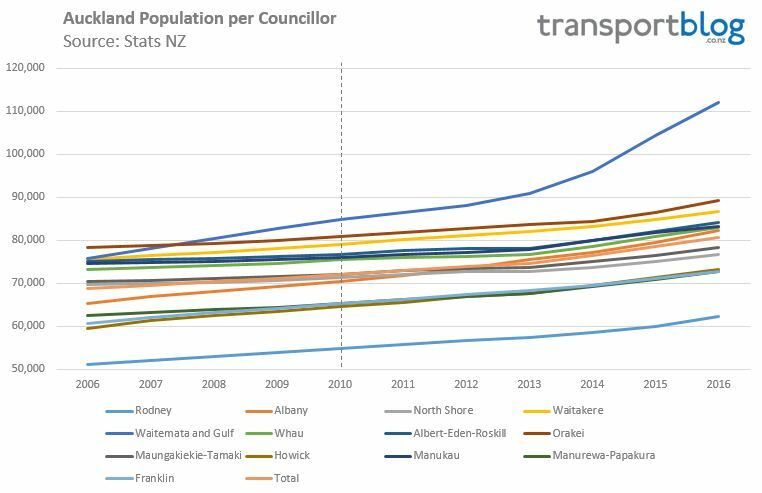 That growth has pushed population in the region above 1.6 million people having only passed 1.5 million about three years ago and at current rates, would see Auckland hit 2 million people in less than a decade. Auckland accounted for 46% of all the growth in NZ. In 1996 Auckland’s population was 1.1 million so in 20 years has grown by the size of the entire Wellington region after taking 51% of NZs total growth. Auckland is now home to 34.4% of New Zealand’s population. 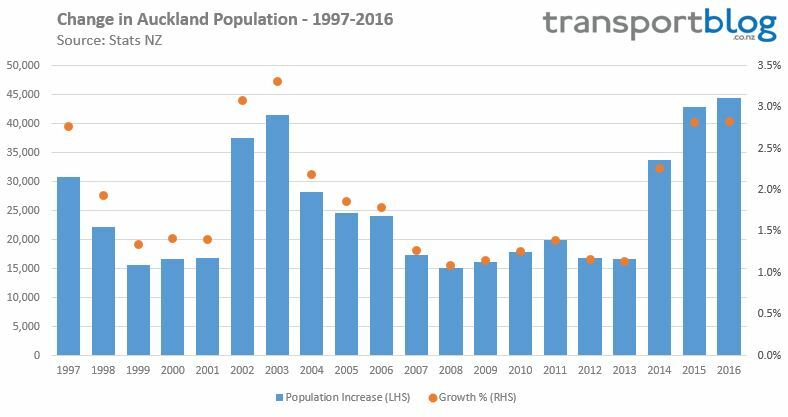 The graph below shows the change in Auckland’s population over the last 20 years and as you can see, as a total the growth this year is the highest ever seen although as a percentage increase, it was topped by 2002 and 2003. At 2.8%, growth is running ahead of even the high growth predictions released by Stats NZ in early 2015 which if it continues will have serious implications for the timing of many projects. 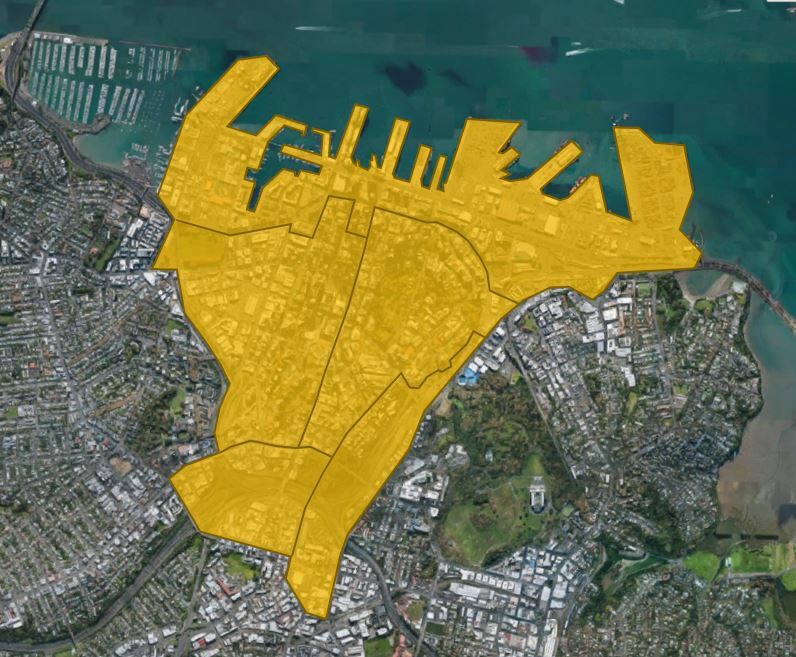 An even more staggering increase can be seen in the Auckland City Centre – as defined as in the map below. This is slightly different from the traditional definition as it includes the area units of Newton (south of Karangahape Rd) and Grafton West (east of Symonds St) and is what was used by the Ministry of Transport when they were monitoring targets for the City Rail Link. 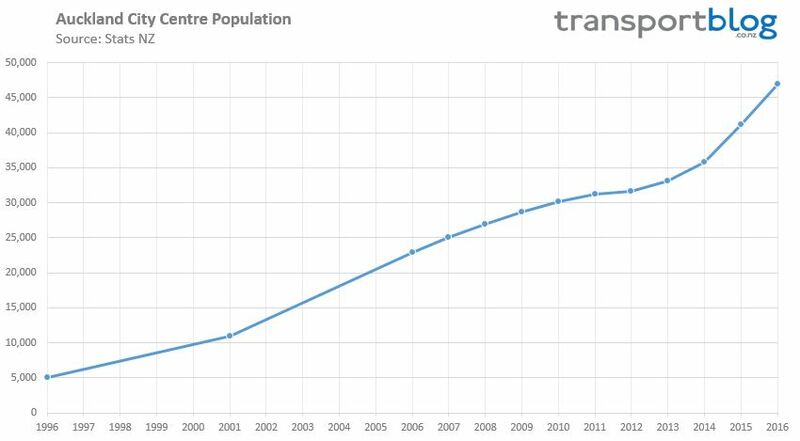 As you can see below, the population of the city centre substantially increased to just shy of 47,000, up from just 5,000 20 years ago, a staggering 924% increase. The increase of 5,770 accounts for a full 13% of Auckland’s growth and 6% of all the growth in NZ over the last year. And of course, more people in the city centre has continued to help in making the place more vibrant and liveable. It also is another reason why it’s important agencies like Auckland Transport need to drastically change how they think about transport in the city. Moving to make it easier for pedestrians (and bikes) will be a key factor in improving the lives of the people living in the area, not to mention the other 100k+ that spend much of their time there every day. Even if you used the more traditional definition of the CBD – the three northernmost areas in the map above, the population is sitting just under 40,000, up 5,000 on last year. As a comparison, the 2012 City Centre Masterplan suggested the CBD would reach not reach a population of 45,000 till 2032. Looking at population at a slightly higher altitude we can see the changes by local board. The biggest increase comes from Waitemata driven by the growth mentioned above. Following that there has been strong growth in a number of local board areas. Many are areas where there is also a lot of greenfield growth has been occurring, such as Upper Harbour so in that regard one that also sticks as having a strong level of growth is Orakei. Given the recent elections, the population figures also got me thinking about the levels of political representation we have and whether the ward boundaries need to be changed before the next election. Auckland has 20 Councillors spread across 13 wards. In 2010 when the city was amalgamated there was a population of 1.44 million meaning for each Councillor there are an average of 72,000 residents. With the population now up to 1.61 million people we’re approaching one Councillor for every 81,000 people, more than twice the number of people per member of parliament. Furthermore, with so much growth in some areas, it’s leading to even more disproportionate representation and this is especially the case in the Waitemata and Gulf area which includes the CBD area. The same issue, although to a lesser extent, exists at the local board level with some local boards having vastly different levels of representation. Each local board has differing numbers of members on them. 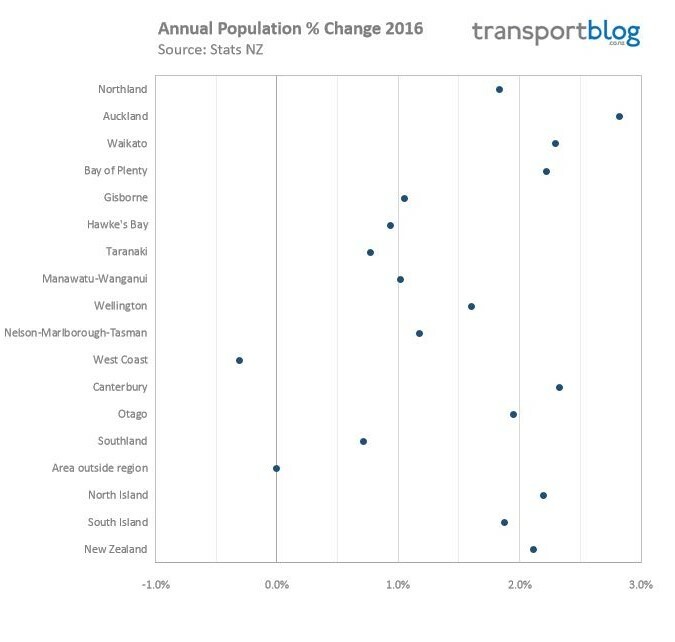 Again, Waitemata is a clear mover although it is still behind the Howick Local Board and Henderson-Massey Local Board on a per population basis. which has the highest population compared. 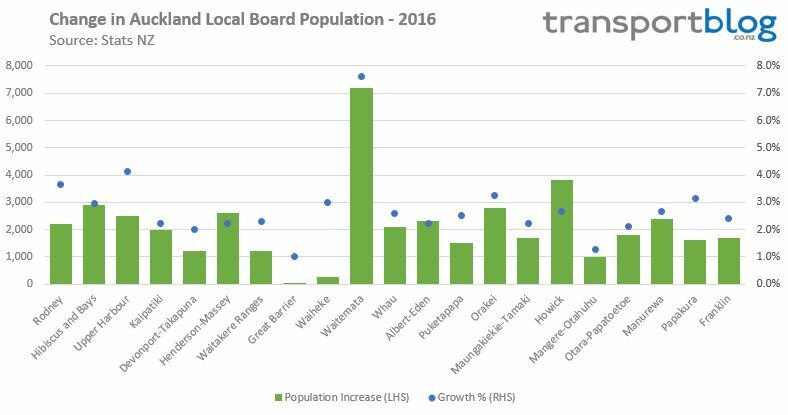 Howick has just over 16,000 people per local board member while Papakura is the lowest of the urban area Local Boards with almost half that at just 8,800 people per member. One of the challenges is that the amalgamation legislation prevents the number of Councillors being increased like can happen in the rest of NZ. It also requires that Council Wards align with the local board areas so any change isn’t straightforward. What do you think should happen, change the ward and local board boundaries, allow for extra Councillors and local board members to be elected, a combination of both or leave things unchanged? Well the people really do like proximity. That is the ‘revealed preference’ in these data. And given the apartment projects currently underway mean this trend will continue for at least the medium term, despite the vast investment in motorways at the fringes which act as subsidise for ex-urban and new distant suburban living. But the constrained and finite nature of the Centre City and the great many restrictions on building at its immediate fringes will eventually constrain that growth. Interesting. I wonder what might be the plateau point? 100k? Higher? And when? And it is very good that you point out that this must lead to changes in street design and public space provision in the City Centre. On the issue of democratic representation the colours on the chart are a little tricky to read but it does seem, to generalise, that the set it up happened to give the poorer and more central areas the weakest representation and changes over time have largely exaggerated that imbalance The exceptions being Orakei on the underrepresented side, and Manurewa-Papakura on the over one. I note the people of Rodney now get almost twice the representation each as those of Waitemata…. There is clearly a conflict between local needs and those of commuters. It’s a tricky balance, but it’s a situation where the most environmentally friendly and generally efficient New Zealanders bear the brunt of unpaid for externalities: Air and Noise pollution, dangerous roads, unsuitable built environment. It sounds dramatic, but it feels that we’re treated as second class citizens in our own neighbourhoods. Amusing dig for an aspiring AT board member Patrick, but what do you suggest? Shall we stretch the boundaries even further? Good grief Tony, you imagine ‘a dig’ in a factual description…. What I suggest is another Councillor for Waitemata in a year or two. You don’t think it is important to aim for fair and equal representation in Council elections? Could the representation commission, who draw up electoral districts, be asked to redraw borders for local body elections at the same time they define electoral districts? Local authorities are required to review their representation arrangements at least once every six years. “One of the factors that local authorities and the Commission must consider when dealing with representation reviews is the ratio between the population of an area and the number of members elected to represent it. hmm but they can’t change the local board boundaries. I see the problem! Clearly needs a law change. While they are at it, perhaps they should also add a Maori ward so there can be some democratic elected Maori roll representation on Council rather than those dubious, unelected ‘advisory’ positions as at present. At some point the boundaries will need to be redefined and at some regular interval going forward, will this coincide with the national level boundary changes or will it be a separate exercise? If it’s a separate excerise should it fit in withe the overall governance review that needs to be made of local government arrangements, or is that to be an ask. 1 year before every election. The simplest solution would be to increase the number of councillors to 21 (22 including the Mayor), giving the mayor the casting vote if the votes are tied, and giving the Waitemata and Gulf ward an extra Councillor. Short of a law change one of the wards must lose one of their councillors, Waitemata and Gulf must be continually underrepresented, or the ward boundaries altered so as to not align as closely with local board boundaries. I don’t think the population per local board member disparities matter much. You didn’t talk about the population per local board member in Great Barrier local board (consisting of Great Barrier Island and the odd other nearby Island) but if each local board had the same number of board members per capita as Great Barrier some local boards would be huge indeed. Also it is a significant fail of the super city legislation that they didn’t allow the number of councillors to increase. Did they not anticipate the population changing differently between different local wards? Well ‘the right’ to use a sweeping generalisation, has routinely poured scorn on all aspects of urban, as opposition to suburban, life. Even to the point of denying its existence, and certainly disbelieving its popularity, or likely growth. So it’s probably safe to assume that Mr Hide doubted anyone but a few oddities would live in the city centre, you know that same number that might ever ride a train…..
And yes Nicolas that would be the simplest way forward, especially as the growth in the city centre is certain to continue given the ongoing construction of apartments. I thought so, too. That’s an aggressive-looking geographic area. Electoral boundaries have changed with increasing population, in order to maintain a ratio of people per MP. A similar thing could be done per councillors. This would mean the total number of councillors would increase slowly over time. – You have one council seat left over – give it to Waitemata & Gulf for a two-councillor ward! Would have to wait 3-6 years from now before Waitemata & Gulf quite has the population to warrant it, but it should work unless Manurewa/Papakura/Franklin/Manukau starts booming disproportionately. No thanks, don’t want Papakura in Franklin. That ok Papakura doesn’t want to be in Franklin, we got away without being swallowed up by either Manukau or Franklin for so long but then came the super city. So the four regions with above average growth is the golden triangle of Auckland/Waikato/Bay of Plenty and Canterbury. So essentially New Zealand has two main areas of growth -the first and biggest in absolute and percentage terms is the areas in and around Auckland. The second is the areas around in and around Christchurch. Both the North and South Island have a node of growth which is greater than the rest of their respective islands. Also of note is how low growth the Wellington region is -despite containing NZ’s capital city and being about the same population size as the Canterbury region. Maybe a case for an Auckland City Centre council representative rather than the current Waitemata one? I notice that, despite our large resident population size in the cbd we are not nimbys. We embrace development. Although I do have some reservations as to whether a stadium in the area will cause alchohol-related issues for centre residents. My preference would be to split up the Waitemata/Gulf ward and give the CBD its own councillor. Mike Lee could then speak freely on behalf of the nouveau-riche inner-West suburbs and Waiheke, while someone else could speak for the most vibrant and growing part of our city. I agree. I’d stand for the cbd and I’m sure they’d be stiff competition. We need representation. The cons of splitting a large ward into smaller could potentially create many tiny cities that doesn’t cooperate. For example if Waitmata is split, we will see skyscraper built on different pockets of the city and nothing in between, instead of concentrated into the centre and progressively get less density. you seem to misunderstand what the wards are. they are not individual administrative units with separate planning controls. I was thinking Texas Sharpshooter! Why does Auckland have fewer Councillors than MPs? Why do we use FPP to elect them? Why are the wards so – effectively – heavily gerrymandered? The under-representation is the reason why there is a breakaway from the city movement on Waiheke. We’re not only drowned on the Council, but our Councillor has no incentive to take any notice of us because his mainland fief is growing much faster. On a more general point, why not just elect Councillors city-wide. The top-20 contenders getting a seat. Or even have a list system with a 5% threshold. I think there is a lot of logic to that, I think the original Super City draft had 12 ward councillors and a further eight to be elected at large. One issue with this is the cost of this may tilt the field to candidates with a high profile or with a wealthy backing as they would be the only ones who could afford say a mail out to the whole of the city.